Tattoos are one of the best ways of expressing ourselves to others. It may look so different for others but it is only a creative way to show up who we really are. Here are some of the unusual or extraordinary tattoos to be ever seen by any one. There’s a new trend of tattoo and it’s called tattoo regret. Tattoos are a creative and permanent medium for self-expression. They’re also so common that nearly one fifth of Americans have at least one. It’s no wonder that new tattoo studios are opening all over the country, especially in those cities that had prior restrictions that forbade tattoo shops. As the stigma attached to tattoos and body modification slowly wanes there’s still a large chance you may experience tattoo regret. While most tattooed people count workplace acceptance and discrimination as their largest pet peeve, others come clean that their design just didn’t make the cut as they matured or changed as a person. Kristen Sorrenson is young, gorgeous and without any tattoos. As irony often proves, Kristen is also one of the most talented, rising tattoo artists in the industry. Tattooing in Queensland, Australia, Kristen studied Interior Design before changing careers out of curiosity and passion. With a steady hand for Realism and black and grey tattoos, Kristen explains why becoming a tattoo artist has made her stubborn, driven, and an independent force to be reckoned with. Shout-out and start speaking out! Be trendy in this kind of look. The following nature custom tattoo designs prove that Mother Nature got it right. 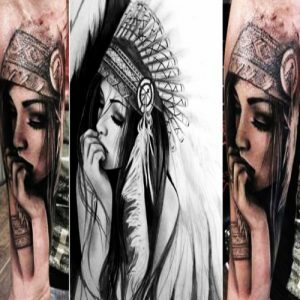 Ramble through this list of wild and free ideas and get inspired for your own colorful, or black and grey body art. Are you curious? That’s natural. Faeries: Whether you believe in the fantastical and mythical world of faeries and nymphs or simply love their enchanting land of make believe, there’s no doubt these winged and mischievous creatures call the woodlands their home. Trees- Tree designs such as cherry, willow and even tree of life tattoos grow tall with meaning. Animals- From snakes, lions, horses and bears, what’s your call of the wild? Animal tattoos can define some of your own personality traits, or pay tribute to endangered and beloved species. Show your support for the pawed and hoofed. Insects- Butterflies, caterpillars and bumble bees all play a very important role in the garden. Water- Did somebody say shark? 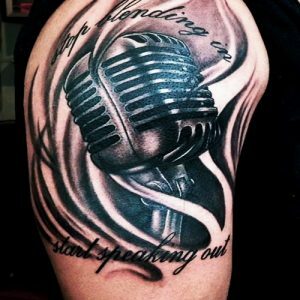 Are you ready to dive into a cool and refreshing tattoo design? Why not consider an ocean theme tattoo? Make some waves with a unique and colorful back piece, and be sure to add some seashells and fish for good measure. Heck, why not throw in a mermaid? For the aquatic lover, tattoo designs go ocean’s deep. Sun and the Moon- The two most prominent lights in the earth’s sky are the sun and the moon.